This is Cinamaker reporting that the future #mojo is alive and well. The 2017 Online News Association conference (ONA) in Washington D.C. was a whirlwind of information, business cards, and free stickers. But between all the handshakes and giveaways, real progress was made for the future of mobile journalism. Every conversation and interaction added just another powerful connection in the huge network of talent, education, technology, and organizations that allow journalists of all sorts to keep doing their thing. For Cinamaker, ONA was a terrific opportunity to collaborate and learn from other pro #mojo companies, institutions, and individuals. We were among the ranks of such internet platforms as Facebook, Instagram, and Reddit, and talked shop with Film and Journalism Professors and Professionals. 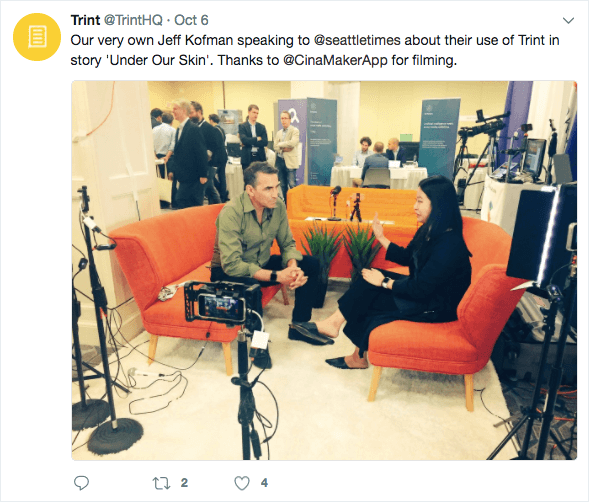 We even had the opportunity to film an interview conducted by Trint, which they graciously credited us for filming on their social feeds. The best takeaway from our ONA encounters was discovering that Cinamaker’s place in the #mojo movement could be even bigger than we thought. As we conferred in our Atlanta headquarters about how Cinamaker might improve the modern journalist’s toolbox, we thought of the obvious, exciting features our mobile studio offers: portability, affordability, live stream capability, mixing, editing… the list goes on! We knew we had a powerful, professional tool that could be accessible for a range of journalists, from independent bloggers to international correspondents. But what about a tool for teachers? A tool for personal brand growth? Once we expanded our conversation to include the thousands of ONA17 attendees, the possibilities for Cinamaker truly seemed endless. A professor of video production explained that if he had Cinamaker for his classroom, he could give live examples of core film concepts like composition, perspective, and lighting in real time for his students. A journalism professor noted its importance for teaching students how to become one-man production studios. And many independent journalists and organizations cited Cinamaker’s live stream capabilities as a huge plus for creating content to define and grow their own brands. Just as our multi-cam made easy technology improves the quality of mobile video production, multiple perspectives improved our understanding of Cinamaker’s true mojo potential. After all, 3,000 head are better than one! We’re thankful to all who came out to this engaging, three-day event. ONA17 and the enlightening personalities we met there will never be forgotten. See the highlights here!